You can choose to add ONE gemstone......please remember to state your stone choice in the notes during check out! The ultimate power crystal, it is a stone of clarity which dispels negativity. Because it directs and amplifies energy, it is extremely beneficial for manifesting, healing, meditation, protection, channeling, and dissolving negative karma. It is a very good stone for astral travel, manifestation, channeling, dream recall and dream work. Although it is assigned to the Crown Chakra, Quartz is also very useful on the third eye chakra for clarity of psychic vision. A stone particularly useful for healers as it channels information regarding holistic and herbal remedies, giving suggestions as to the most holistic action to take and receiving guidance on health matters and well-being. Fuchsite helps to overcome codependency and aids in a speedy recovery from trauma, both emotionally and physically. It also increases the energy of other crystals and helps in the transfer of their energy. A protecting, grounding and centering stone that amplifies energy and helps bring inner peace. It is also used to clear negativity in the environment. It is an amplifier of learning abilities and therefore a great stone for students. In the realm of relationships, calcite brings its properties of grounding and centering, to make it a stone of reconciliation. Originally a stone that only shamans and religious leaders were permitted to use, today it’s still revered as a premier stone of protection from negative energies. It guards against radiation and environmental pollutants, and is highly useful in purifying and neutralizing negative thoughts turning them into positive, usable energy. Wear this crystal for protection against negative people who are particularly prone to burdening others with their problems. One of the strongest healing stones on the mineral kingdom, it has the ability to align every chakra when applied to a given chakra. This stone helps restore alkalinity to the body while lowering calcium levels in the body which can help decalcify the pineal gland. This is done by placing it one inch above the navel chakra. All variations of Kyanite are high vibration crystals and are powerful stones to align the chakras. All colors of this stone have particular chakras that it is most effective to heal, but all have the ability to align all of the chakras. This is a most powerful stone for healing you if you have had accidents or surgery on any part of the body, as this may have resulted in energy gaps, which blue Kyanite will bridge. It is also helpful if you are low in energy as it will assist trauma and replenish your energy. Increases mental clarity, honesty, and psychic intuition. Dispels negativity and attracts harmony within relationships. Meditation should always begin with a piece of Selenite whenever possible for its ability to remove blockages as well as bring angelic communication. 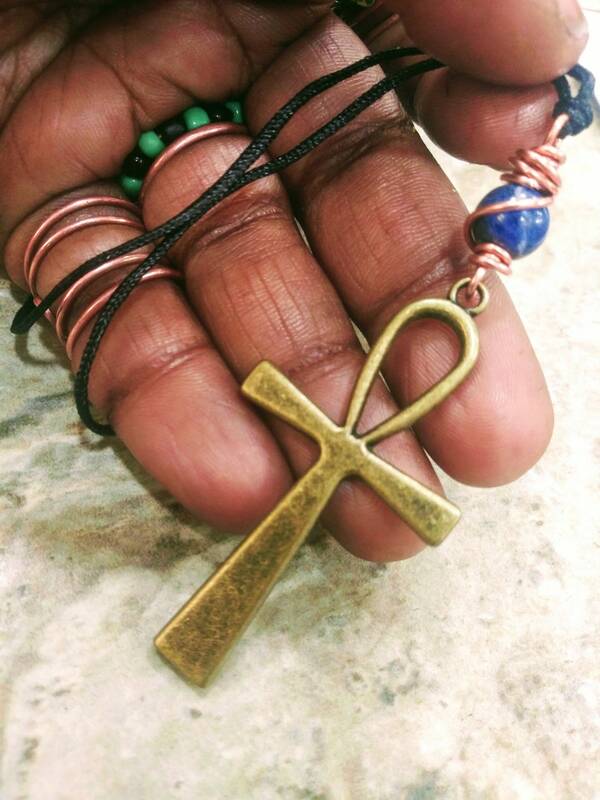 Super fine little ankh, got 3 small gemstones for free as a surprise and for that I must say THANK YOU <333 For the small price and free shipping you cannot go wrong with this fine piece of brass ankh! In love with the ankh AND the gift that came along with it (an amethyst necklace). Would definitely purchase from this shop again!